The people who live in the favelas (slums) of Rio de Janeiro create strategies to celebrate life despite the social pressures to which they are subject. They are not just "the oppressed." Rather, they are obviously human beings who love, hate, enjoy and suffer. They are, like all of us, both manipulators and victims in their relations with neighbors, driven by the irrationality of human feelings. 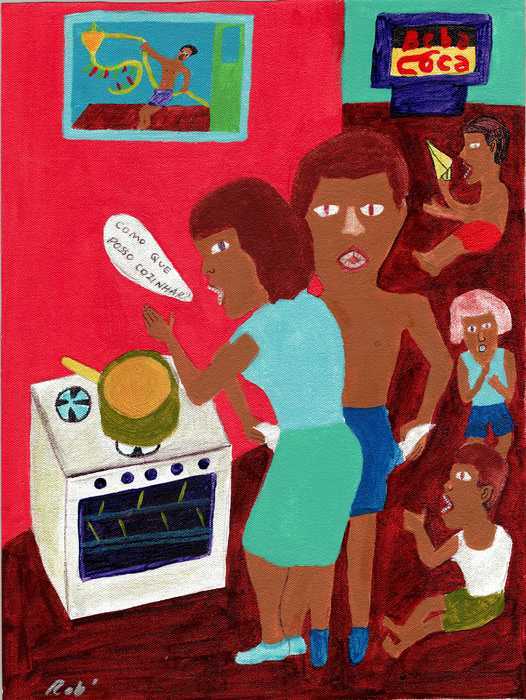 The propaganda of the ruling classes seeks to dehumanize the favelados (slums dwellers) by focusing on the favelas' high crime rate, the favelados' lack of knowledge about the official culture, etc. Of course, the struggle for power is manifest in the favelas, as in all societies, also in the interpersonal relationships of everyday life. My works are created almost spontaneously. Generally, I start with a theme in my mind. I do not usually make sketches. 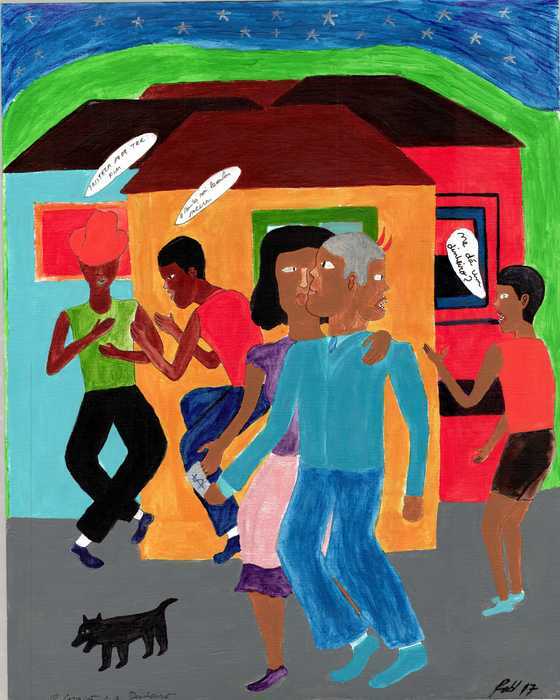 However, my style is influenced by Heitor dos Prazeres, a Naive painter from the favelas of the 20th century whom I admire, as well as by folk art from the Brazilian Northeast. 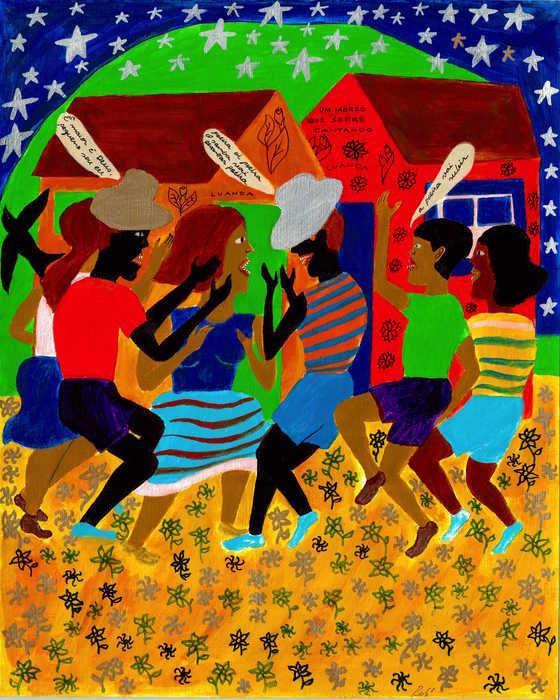 Naive art finds very original moments in Rio de Janeiro mainly in the encounter between the Portuguese colonization and the reaction to colonization by the groups of African origin. This unique blend of Afro-Portuguese culture is the focus of my style. Although my style of painting is cataloged as naive art, I prefer to think of it as a kind of folk art. My main purpose is that my work can be understood by people in general and especially by the people who belong to the social level that my paintings depict. I do not care much about how my paintings are labeled or defined in terms of a style of painting. The most important, really, is the artwork itself and the capacity it has in a given society to communicate ideas and allow different interpretations and conclusions from the public. As Machado de Assis wrote, "the creation is everything." What is left is just the opinion of each person. Celebrating the intensity of life.